Have lots of photos on the app that are starting to eat up your mobile device’s memory? This is exactly why we have the cloud-only backup option in place. As you scan boxes and boxes of old photos with the app, it’s easy to lose track of the large number of photos saved in the app. 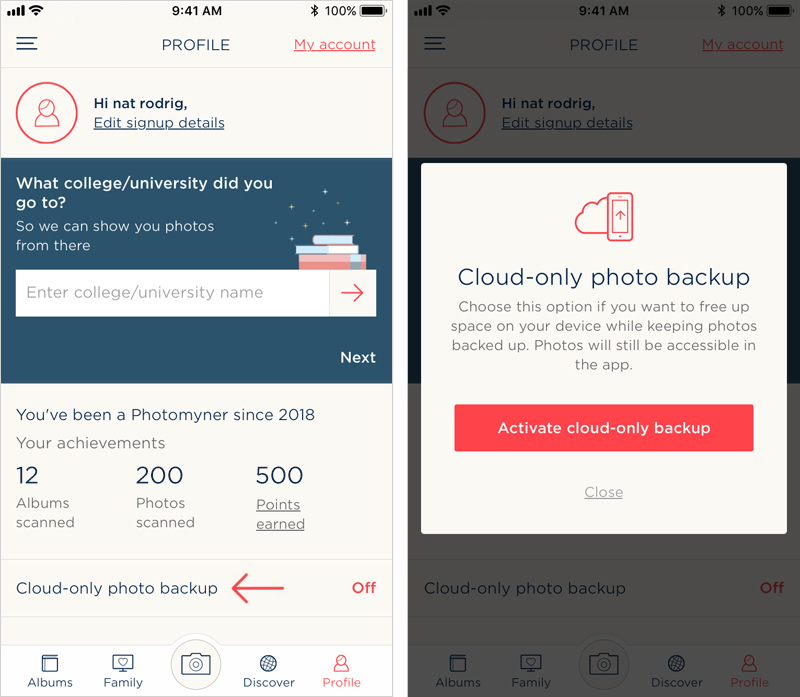 Since these do take up space on your device, we’ve come up with a special feature to handle the memory use of Photomyne on your mobile device: cloud-only photo backup. A special feature open only to Photomyne account members, the cloud-only backup option will help you free up space on your device. Plus, you will still have access to your photos. It’s the best of both worlds! First, you will need to be a Photomyne account member to activate this option. Learn more about the Photomyne subscription account here. Once signed up to Photomyne, simply go to the Profile tab on the bottom navigation bar. Inside your account, look for the Cloud-only photo backup option and tap it. This will prompt a pop-up window, briefly explaining what the cloud-only backup is and a button to activate it. Tap to activate. That’s it. Cloud-only photo backup is now active. It will be a seamless process in the background and you needn’t do anything else. Just keep using the app as you have before. The only difference is that your scanned photos won’t take up more of your device’s memory. Please note: If you delete any photos from the app their cloud-only backup copy will also be deleted.